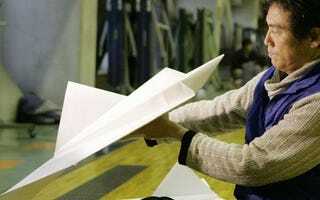 Takuo Toda, head of the Japan Origami Airplane Association (classy!) set a new world record with his 27.9 second flight. His greatest ambition, however, is to launch a paper plane...from space. Toda's record-breaking paper plane was made from one uncut sheet of paper, because he's a pro, and professional origami airplane modelers would never stoop so far as to use scissors. The Telegraph reports that the plane was 10cm long (about four inches), which seems tiny to us, but then, we're not paper aviation experts. Oddly, Toda wants to launch his specially-designed paper planes from space. Seriously. The Japan Aerospace Exploration Agency announced that it would fund a three-year, 90 million yen (£617,000) study into the feasibility of launching paper darts from the International Space Station.